On the 6th of March, starting 12 PM, tickets go on sale for 2019 George Enescu International Festival (31 August – 22 September, Bucharest). There will be 5 categories of tickets, with prices varying between RON 30 and RON 210. Music lovers will be able to choose among the 84 concerts divided into 5 series: “Great Orchestras of the World”, “Recitals and Chamber Music”, which integrates the section “Enescu and His Contemporaries”, “By Midnight Concerts”, “Music of the 21st Century”. Other notable events are also scheduled, such as “Mozart Week in Residence” and “International Composers’ Forum”. The 2019 edition of the Enescu Festival awaits its audience in Bucharest at: the Palace Hall, the Romanian Athenaeum, the Radio Hall, the Small Palace Hall, as well as in 8 other cities: Cluj-Napoca, Timișoara, Iași, Sibiu, Târgu Mureș, Bacău, Bârlad and Târgoviște. Tickets will be sold online on www.eventim.ro, as well as in the network of Eventim stores (Telekom, Orange, Vodafone, Diverta, Humanitas and Cărturești bookshops, Carrefour and OMV stations) and in the Eventim offices in Bucharest (Bdul I.C.Brătianu, Nr.6 in Cinema PRO) and Cluj-Napoca (Str. Alexandru Vaida-Voevod, Nr. 53 B in Iulius Mall), UPC cashier’s offices in Bucharest and Cluj-Napoca. Some of the seats available at this edition have been allocated to festival passes. A total number of 1,870 passes were sold at the lottery organised at the end of last year, representing about a third of the total number of seats at the Festival. About 20% of the total number of available tickets were put up for sale in international travel agency packages, and 10% are reserved for guest artists, partners and officials. The individual tickets put up for sale starting 6 March are approximately 33,000. The program of 2019 George Enescu Festival was drawn up in such a way as to be a manifestation of current trends in the international cultural space, exploring its lyrical and dramatic sides, as well as the highlights of contemporary music. Famous works will be performed for the very first time in Bucharest. Music lovers will have access to big, impressive, high-class concerts, as well as more intimate listening experiences during recitals and chamber concerts. The audience will also be connected to contemporary music trends in the international cultural space, by way of the dialogues between musicians and composers. Depending on their preferences, music lovers can select new, special performances, they can choose to listen to new compositions, or try concerts approached in the classical style or in a modern way, such as, for instance, the series of operas in concert. In the Great Orchestras category, we will see Berliner Philharmoniker, London Symphony Orchestra, Royal Concertgebouw Amsterdam, Orchestre National de France, State Academic Symphony Orchestra of Russia, Oslo Philharmonic Orchestra, and Saint Petersburg Symphony Orchestra. Remarkable conductors such as Kirill Petrenko, Mariss Jansons or Vladimir Jurowski and renowned, appreciated soloists like Diana Damrau, Marlis Petersen, Joyce DiDonato, Yuja Wang, etc. will perform at the Festival. As for the repertoire, this year’s edition enforces the opera in concert with a total number of 14 works, of which the following will be heard for the very first time in Romania: Strauss’ Die Frau Ohne Schatten, performed by the Berlin Radio Orchestra, Schoenberg’s Moses and Aaron, performed by the George Enescu Philharmonic, and Britten’s Peter Grimes, presented by the National Radio Orchestra. Another premiere will be George Enescu’s Symphony No. 3, performed by two orchestras: the Maggio Fiorentino and Berlin Radio Orchestras. Throughout the Festival, a total number of 32 of George Enescu’s works will be performed. Mozart Week in Residence will be another notable moment – a program that has been brought straight from Salzburg, which goes beyond concerts and conferences to encapsulate details of the events in Mozart’s life. On this occasion, the violin that Mozart used to play will also be exhibited. The “Music of the 21st Century” category will bring to the forefront established figures like Unsuk Chin, Fedele, Widmann, Penderecki, composers whose works are presented by the great orchestras of the world. Some of the most important Romanian presences are conductors Horia Andreescu, Cristian Mandeal and Christian Badea. Gabriel Bebeșelea, Tiberiu Soare, Vlad Vizireanu and Cristian Lupeș will also conduct Romanian and foreign orchestras taking part in the Festival. The most important Romanian orchestras will also be present, from George Enescu Philharmonic Orchestra to the Radio Orchestra and the Romanian Youth Orchestra, and the philharmonic orchestras of Iași, Sibiu, Timișoara, Cluj, Bacău and Târgu Mureș. The renowned conductor Ion Marin will take the stage at the Enescu Festival once again, as well as the pianist Alexandra Dariescu and the mezzo-soprano Ruxandra Donose, while the pianist Alexandra Silocea will be present for the first time. The laureates of the 2018 edition of the George Enescu International Competition will give concerts within the series “Music of the 21st Century”. 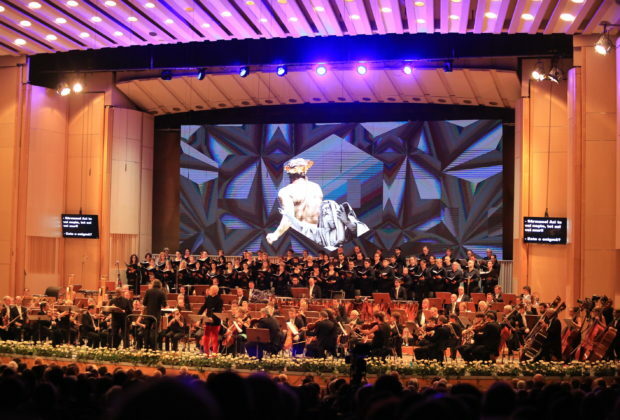 Overall, for 23 days the 2019 edition of George Enescu International Festival brings over 2,500 of the most valuable personalities of the world, a number of 34 premieres, including the presence of 25 high‑calibre artists such as Marion Cotillard, Kiril Petrenko, Mitsuko Uchida, René Jacobs, Diana Damrau, Joyce DiDonato, Rolando Villazón, Julia Fischer and Nobuyuki Tsujii and 9 world-class orchestras. You can plan ahead by checking the program of the 2019 edition on the Festival website https://www.festivalenescu.ro/en/, PROGRAM section.